These findings should alarm anybody who believes in the integrity of science and peer review. Clearly the whole study is worthless, and the paper should be withdrawn. Many thanks to some real Sherlock Holmes work by Joe and Dave. Arthropods, invertebrates including insects that have external skeletons, are declining at an alarming rate. While the tropics harbor the majority of arthropod species, little is known about trends in their abundance. 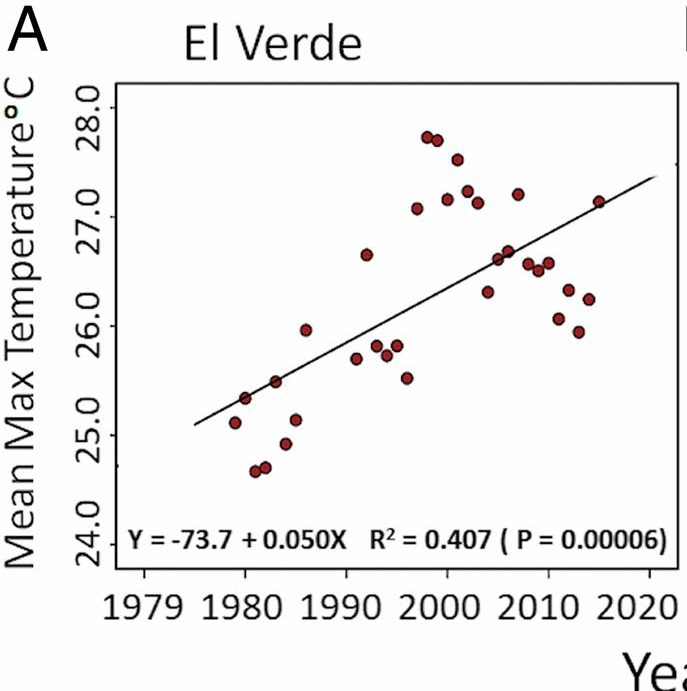 We compared arthropod biomass in Puerto Rico’s Luquillo rainforest with data taken during the 1970s and found that biomass had fallen 10 to 60 times. Our analyses revealed synchronous declines in the lizards, frogs, and birds that eat arthropods. Over the past 30 years, forest temperatures have risen 2.0 °C, and our study indicates that climate warming is the driving force behind the collapse of the forest’s food web. If supported by further research, the impact of climate change on tropical ecosystems may be much greater than currently anticipated. Sounds like an open and shut case eh? 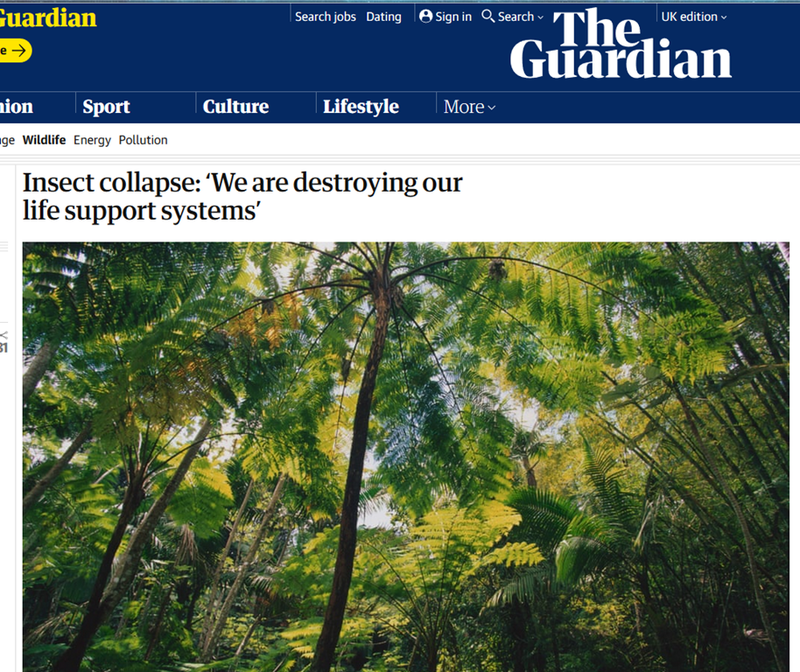 Given that, as the paper itself admits, warming in the tropics in theory should be much less than elsewhere, claims of a 2C increase since the 1970s did not pass the sniff test. 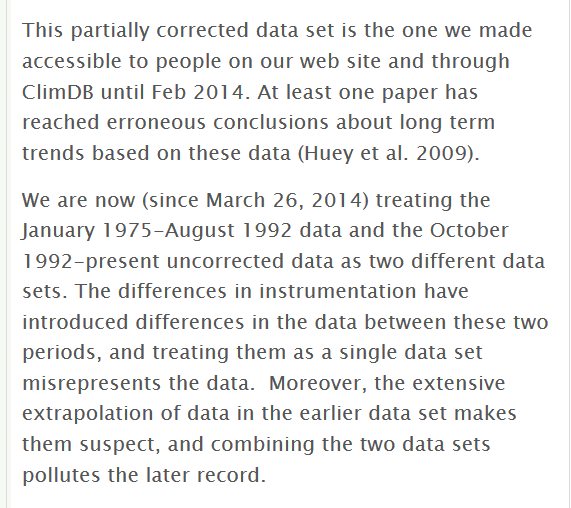 Fortunately Joe Public decided to go away and check the actual data used by Lister. His findings should alarm anybody who believes in the integrity of science and peer review. Let’s take a closer look at those graphs. 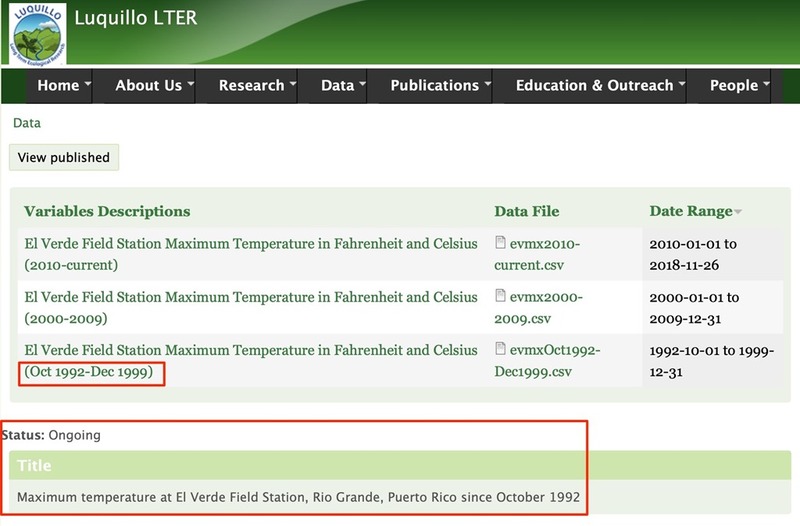 All the temperature data used comes from just two sites, El Verde and Bisley (not Bisely). 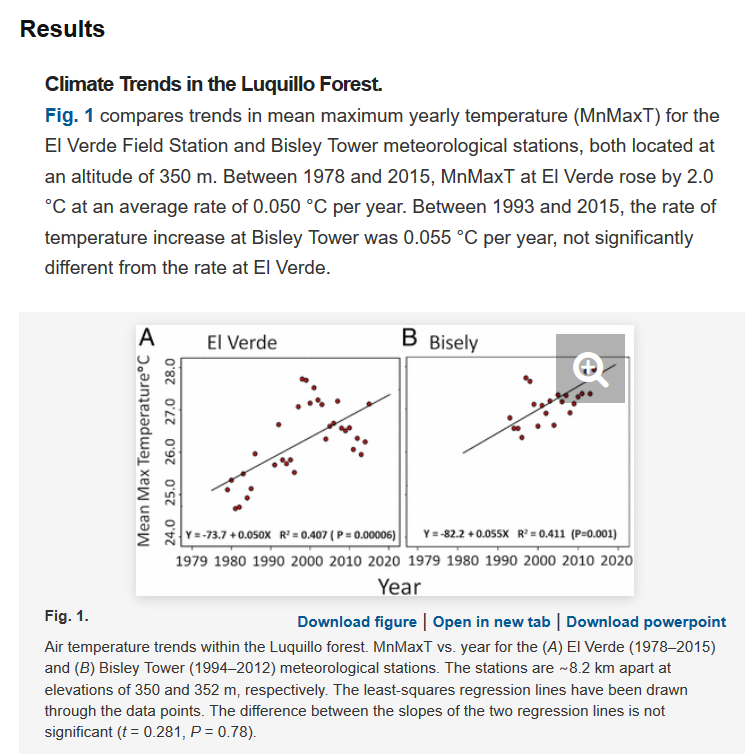 But Bisley data only begins in 1993, so the comparisons with the 1970s rely solely on El Verde, the data for which is sourced from here. In short, the data Lister uses prior to 1992 is worthless, and were substantially understated in comparison with those that followed. If we begin the chart in 1992, we find that temperatures have actually been dropping, and not increasing. 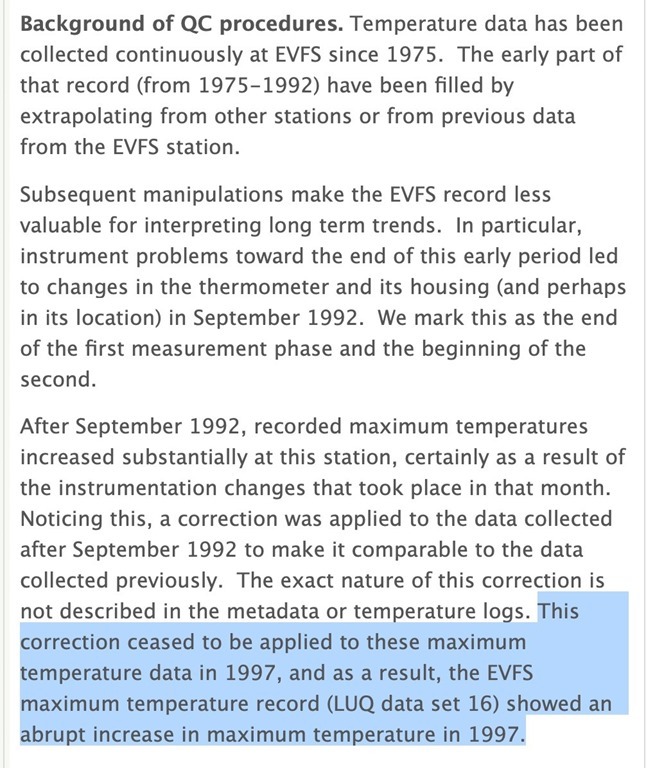 The conclusion is that the faulty temperature data matched the researchers’ expectations of climate warming, and consequently they never bothered to crosscheck. It would after all have been extremely simple to have asked the people who maintain the data. 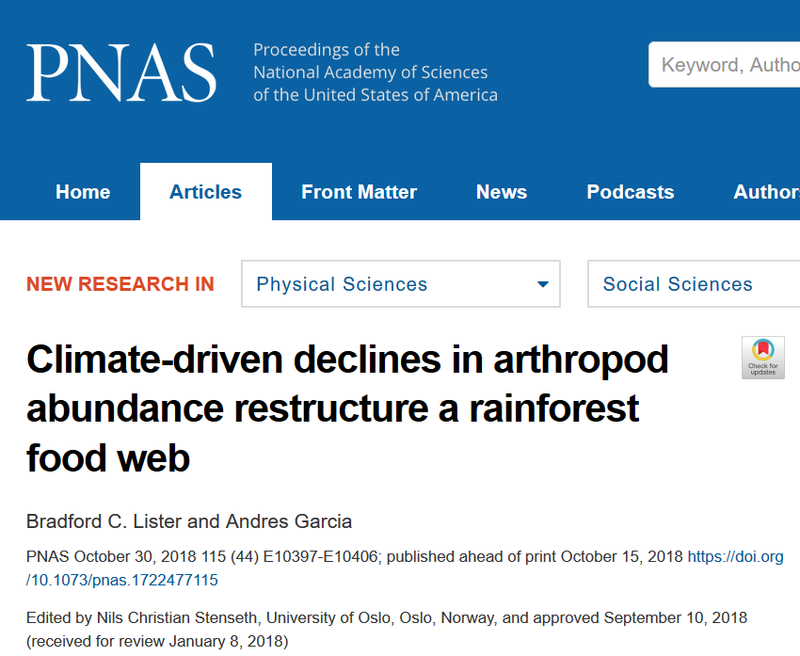 Whether or not arthropods are in decline I have no idea. 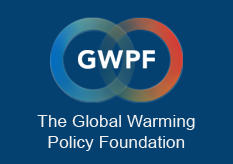 But by blaming non existent climate warming, there is a very real danger that the true cause is being missed. Indeed, looking at those graphs, it may well be climate cooling that is responsible. I plan to contact PNAS, who published the paper, to request that it be withdrawn.